Egglham is a small rural town in Bavaria. Today Egglham has 20 or so storefront-type businesses on its main street, and two small factories on the outskirts of town. Bavaria is covered with small villages - each village is a group of houses with red tiled roofs, surrounding a church with a steeple. Egglham. 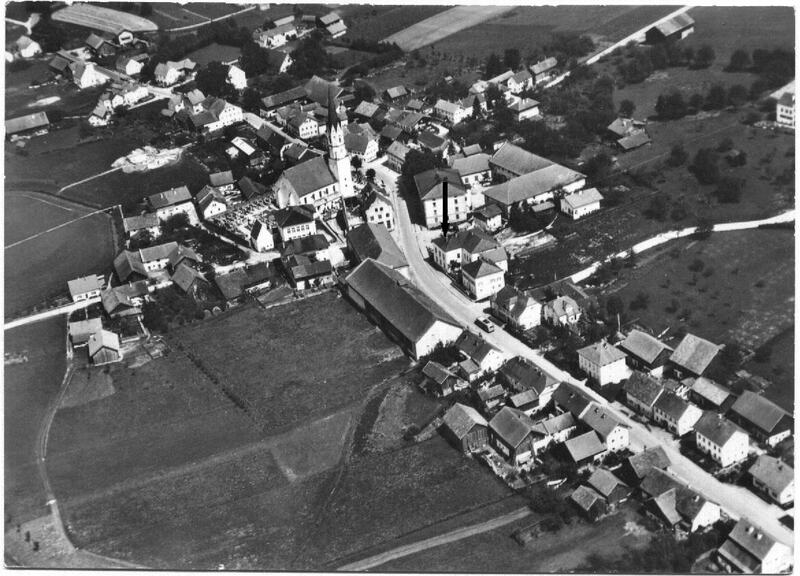 Aerial photo from 1950’s or thereabouts. Arrow points to location of the Wagerer house which was torn down. Egglham is not much different from the other Bavarian villages - the church bell marks each quarter hour and announces the hours. A recent administrative reorganization assigned several of the surrounding areas to Egglham's town government. This region, the Egglham "Gemeinamt" (roughly township), has about 1500 residents. In the 1880's Egglham had about 500 residents. 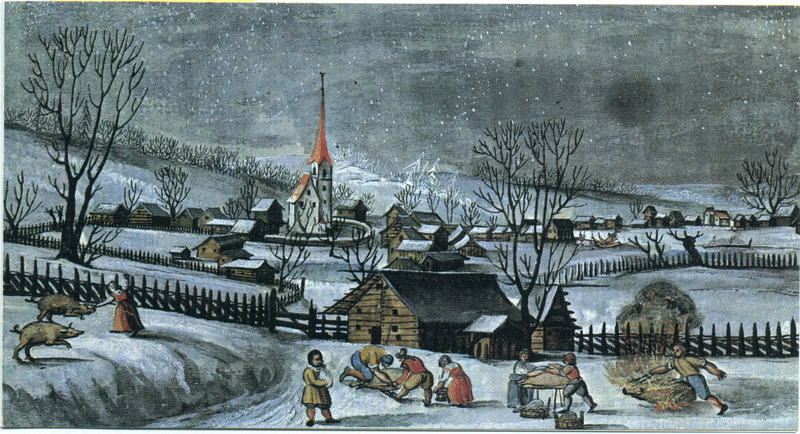 Postcard 3, the Christmas card, shows a historical painting of Egglham, as it was about 1625. The church in Egglham, as almost all churches in Bavaria, is Roman Catholic. The large towns might have a Protestant church or two, but the countryside has crucifixes at all the main road junctions and every house has at least one crucifix outside. The author was especially impressed with the war memorial in front of the church. The village had tremendous losses for such a small population. 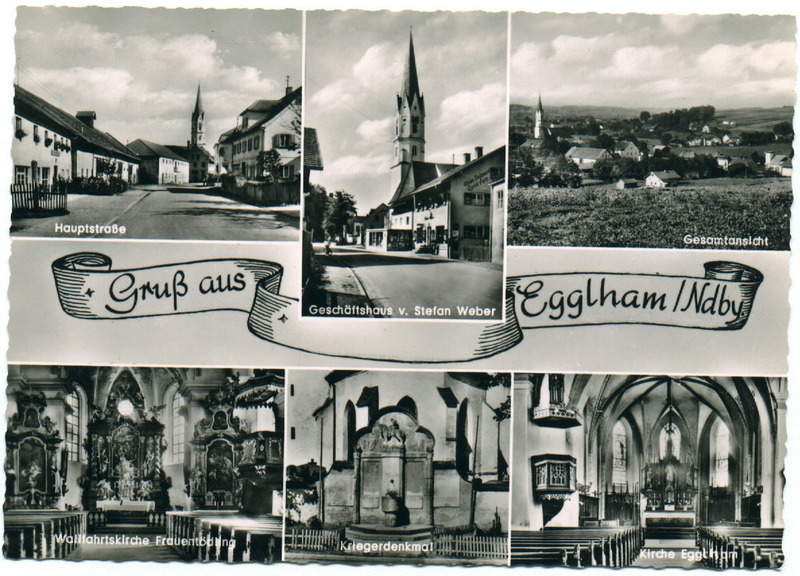 Egglham is in "Nieder Bayern" or lower Bavaria. [See the maps, most of the towns mentioned herein are underlined on the third map.] The region is mostly low rolling hills. Most of the steeper hills and a little of the low ground are forest, perhaps 5 or 10 percent of the total land. All the rest of the land is farmland or pasture. All of the forest seems to be held for timber and systematic replanting was evident. The woods are periodically cleaned of twigs and fallen branches, which are used for firewood. The farms, while small by American standards, are highly mechanized. Tourists sometimes characterize Bavaria by its largest city and capitol, Munich, and the nearby industrial area. Munich, however, is an island in a sea of small villages and farms and is not typical of the rest of Bavaria. Bavarians speak a strong dialect that is not easily understood by Germans from other regions. Standard German is the written language and today most Bavarians can speak standard German.